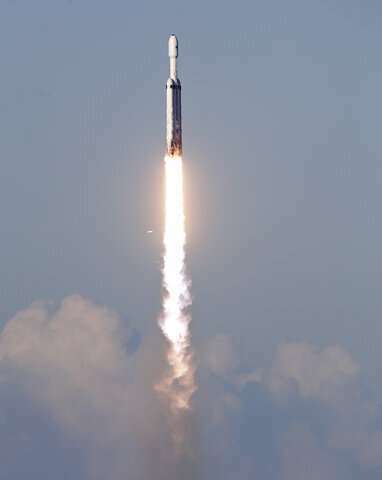 The new and improved Falcon Heavy thundered into the early evening sky with a communication satellite called Arabsat, the rocket's first paying customer. 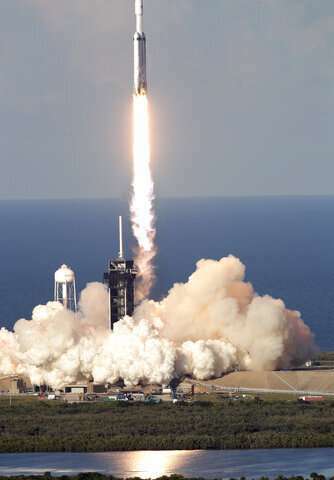 The Falcon Heavy is the most powerful rocket in use today, with 27 engines firing at liftoff—nine per booster. Musk put his own Tesla convertible on last year's demo. The red Roadster—with a mannequin, dubbed Starman, likely still at the wheel—remains in a solar orbit stretching just past Mars. NASA Administrator Jim Bridenstine last month suggested possibly using a Falcon Heavy—and another company's big rocket—to get the space agency's Orion capsule around the moon, minus a crew, in 2020. But the preferred method remains NASA's own Space Launch System mega rocket—if it can be ready by then. It is great for the US to begin the reliance on SpaceX for LEO and wean itself away from dependence on Balkonur. Landing all three boosters is a neat trick. Given how hard that seems to do they are doing a remarkable job at turning something that seemed almost impossible a few years ago into "business as usual"
i can't tell the articles from the adverts now, maybe it's inevitable. Yes, and as I recall a few years ago you offered the opinion that there was no way this could be cost effective. "Landing all three boosters is a neat trick" What hubris. It is still a trick. They're actually re-using only the engines. The rest of the booster is still scrap, because the very high vibration loads cause fatigue cracking in the aluminum alloys and there isn't enough safety margins (for weight reasons) to launch the same whole booster again. It's like taking the engine out of a top-fuel dragster and rebuilding the rest of the frame after each race. Secondly, SpaceX has a success rate of 97.1% for the Falcon 9 family - not different from the rest of the launch industry - and each booster needs to be re-used more than 12 times for the system to save any money. You can do the math: the probability of surviving the 13th launch is 68% and at 24 launches its 49%. So far they've not flown any individual booster more than three times to my knowledge. Put simply, they haven't actually demonstrated any results. Not enough launches, not enough re-used boosters yet. The fatigue problem is also one reason why SpaceX is designing the Starship rocket out of steel. Steel has a so-called fatigue limit. It means you can engineer steel for "unlimited" stress cycles as long as you add enough material to keep the vibration-induced stress below a certain threshold amplitude, whereas with aluminum, magnesium, etc. light alloys or carbon fiber composites there is no such limit, and you always get microscopic cracks that grow with each vibration until the structure fails catastrophically. Steel can be over-engineered to hold on forever, as long as it doesn't rust. The lighter alloys have to be replaced after so many hours under cycling loads or vibration, or in the case of rockets, after so many minutes of operation. The additional difficulty for designing with the lighter alloys is that the mathematical models for predicting fatigue life for the parts are all empirical - they're not entirely reliable and applicable to all situations. Continuous launch to booster landing video taken with decent tracking equipment. 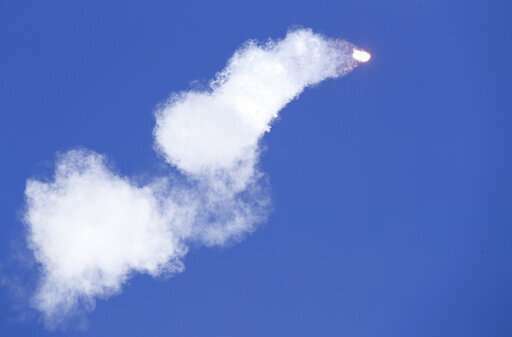 Notice how, moments after launch, the center booster throttles back, resulting in a forked flame. The momentary water pressure drop we experienced last evening was all the other rocket companies taking a collective dump. It is still a trick. They're actually re-using only the engines. So you are saying that Space X purposely smudges up the sides of new boosters to make them look like they are recycled??? Dude, your thought processes are deteriorating fast. Do some RESEARCH before posting GARBAGE. 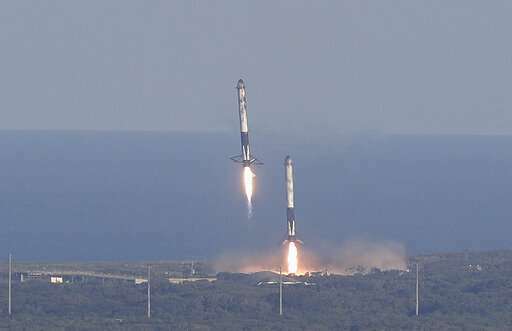 Spacex relaunches entire boosters. "The Falcon 9 Block 5 is optimized for rapid reusability, according to the company. It boasts a number of improvements that make the vehicle easier to land after launch, as well as upgrades that minimize the amount of refurbishment the rocket needs between flights. 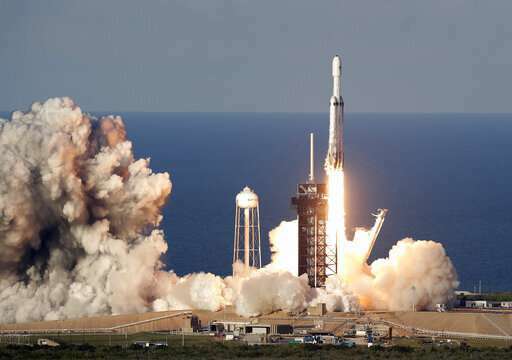 SpaceX CEO Elon Musk claims that the Block 5s won't need any major refurbishment for the first 10 flights or so, and could potentially fly up to 100 times before being retired." -Its like you're saying that 747s can only be flown 10 times before the engines are pulled and the rest of the plane replaced. You're just making stuff up and its embarrassing. What makes you think you have any idea you know what you are talking about? 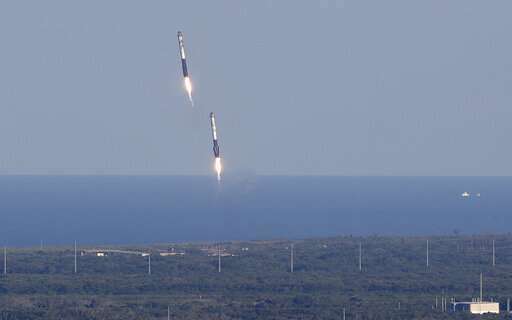 Watching 2 boosters land simultaneously has got to be one of the great videos ever! WG posts always lack snark. Why is that? Be nasty once in awhile. Re eikka 'comments', consider the shuttle design which was built to tolerate far more complex eccentric loads over many more launches and landings. Also consider naval fighter jets on 100s of carrier landings and catapult takeoffs. Engrs know what theyre doing. 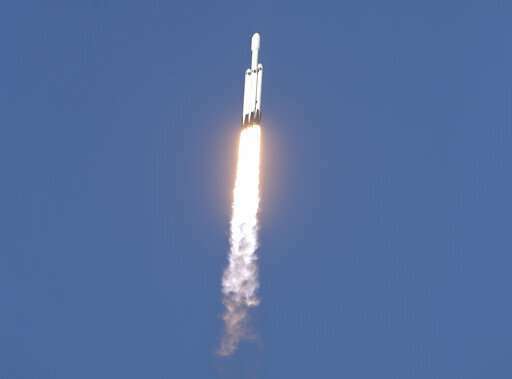 I am not a big Musk fan but I will admit that SpaceX is a fantastic achievement. He did put together a great team there. I'm impressed as well. That team is definitely staying busy. I was reading somewhere that sometime eventually the entire falcon 9 booster will be replaced with the 1st stage of the starship hopper (BFR), and that what we're seeing right now is just a test bed for that future vehicle. And yeah, Musk may not be the most charismatic speaker, but I don't think he's the type of person living his life to be that perfect role model type that everyone looks up to. He's seems to be more grounded in completing feats of engineering which involve logical steps of improving old and costly design models such as throwaway spacecraft. Sooner or later somebody needed to do it. Very ignorant comparisons, since none of those are subjected to the extreme temperatures those boosters must endure. ...from the king of ignorance as I understand it? You dont think the space shuttle endured even more severe stress on trips to and from the ISS? Spending weeks in space, in and out of the sun, main engines using the same fuel on the same trajectories, having to endure reentry temps from orbit that those boosters will never see? "The Falcon 9 heavy rocket has a thrust of about 5,340,000 pounds (23700 kN) with a LEO payload of 140,660 pounds (65.7 t). The Space Shuttle, on the other hand, had a thrust of 6,780,000 pounds"
Did the shuttle itself hold tons of propellant at extremely cold temperatures? The shuttle was engineered for those temperatures, and after every launch, its tiles had to be examined and damaged ones replaced. In fact the shuttle accidents were directly related to freezing temperatures. -- use a brain, idiot. The Falcon boosters are also moving at less than full orbital, with the paired boosters being able to slow enough and return to the essential take off point, the center booster, having taken on that much more speed, had to land further downrange with a longer glidepath. The most the boosters go through is hypersonic and they are rocket controlled, so able to keep their speed under the burnup levels. Now, the second stage is, so far, beyond recovery due to the very much faster speed put on it, THAT would require a full heatshield system like Apollo, Soyuz or Shuttle, or the newer man-rated capsules. But coming in on a powered landing like that means you do Not have to go through the unbearable plasma forming highspeed return. One gently powers oneself out of orbit, that is what their decel burns and the timed burns before their final landing burn. Gorgeous to watch, after seeing Saturn V after Saturn V land in the water as disposable. These boosters are treated like egg crates. And we learn that the center booster was destroyed when heavy seas toppled it. (The octagrabber robot that was supposed to grab a booster and secure it has not yet been adapted to FH core boosters.) The engines may be salvageable. Octagrabber aside, I wonder if something larger than a converted barge for a recovery craft would be worth it. It might offer more stability and maybe be more robust in face of bad weather, reducing the threat of postponed launches. Perhaps it could have a strongback-like device which could actually get the booster horizontal, better secured and covered. It might be faster than the barge too, saving time and reducing the weather vulnerability window. Maybe they could even start to do some refurb operations on it.